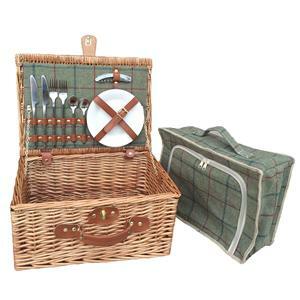 The complete luxury picnic set for 2 people and is the perfect way to enjoy each others company. The hamper is luxury light steamed willow, real leather straps, removable chiller bag, full crockery set for 2 & stainless steel cutlery. Contents: 2 x 7" Porcelain Plates; 2 x Knives, Forks & Spoons; 1 x bottle opener; removable cooler bag. Length: 410mm, Width: 300mm, Height: 190mm, Weight: 2300g.